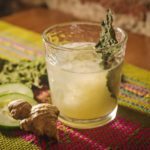 You’ve probably recognized from our recent food post, along with our various Oaxacan cocktail posts on Instagram that we spent 2 weeks over the Christmas holiday in the ever-so-charming town of Oaxaca, Mexico. Like every good foodie, though, it was important for us to figure out where we were going to rest our heads and our expanding waistlines after all of the good food and drink we consumed there. 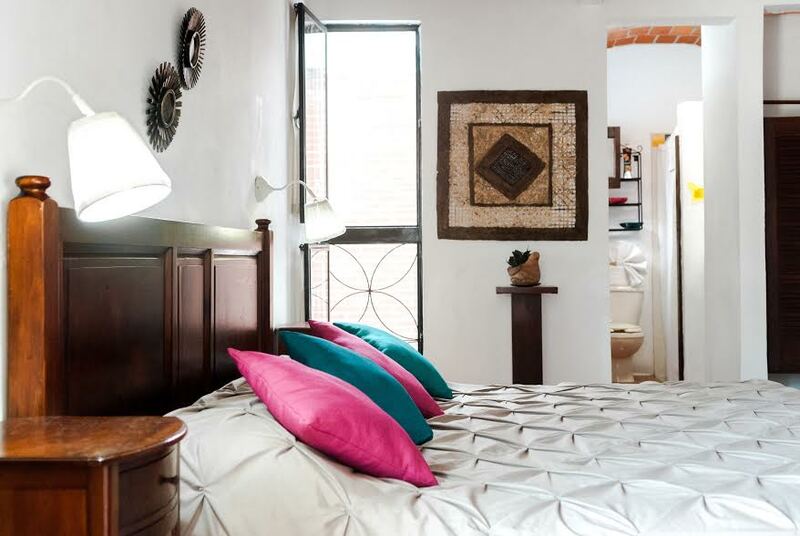 Oaxaca is really busy during Christmas and New Years, so we recommend booking lodging way in advance. We were fortunate enough to be hosted by two places that we very much enjoyed that we’d like to recommend to you here. While this is a sponsored post, it represents our true opinions, just like all of our other features. Cute name, right? When Maria, the hotel’s owner, was growing up, her parents had an ashtray with a devil and a watermelon on it, and that’s how she conceptualized the name for her B&B. El Diablo y La Sandia has two locations, and we stayed at the B&B on Boca del Monte. We found the location to be a perfect spot from which to launch all of our explorations of the town. 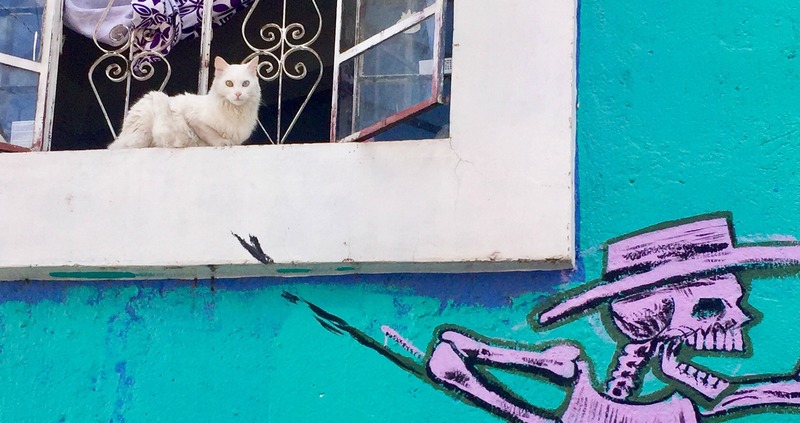 It’s on a quiet side street that is removed from the hustle and bustle of the main areas where tourists hang out (like the Templo de Santo Domingo de Guzman and the market areas), but close enough that everything is within walking distance. The B&B is tucked between houses, in a way that makes you feel that you’re part of the neighborhood. In fact, we became ‘best friends’ with the neighbor’s cat, who you can see on our header photo;). In addition to its prime location, El Diablo y La Sandia is cozy, sweetly-decorated, and run by people who are passionate about hosting. 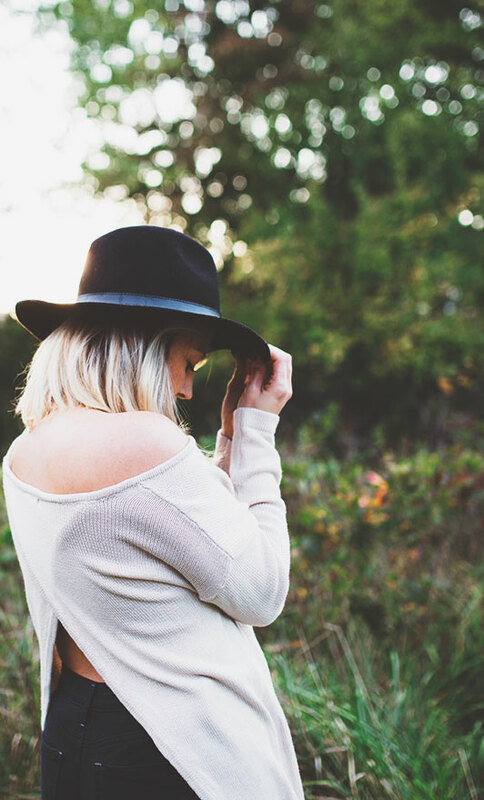 Maria is a kind, lovely, and soft-spoken woman who we definitely would have adopted as our friend had she not been spending time with family for the holidays. She explained to us that her parents had many international friends when she was growing up, and that she would always love when they visited. She would cook them breakfast and entertain them, and it slowly but surely became apparent to her that she might love the idea of turning her passion into her profession. She got into the hospitality business working at the other hotel location (that was under a different name). When it closed, she decided to reopen it with her own name, and her own decor, and now her business has expanded to two equally cute and quaint locations, both of which we’d highly recommend. Two locations with 14 rooms in total, so you can choose your desired neighborhood. We already mentioned what a gem Maria is, and she lives at the Boca del Monte location and is always willing to chat and give Oaxaca recommendations. She’s about to welcome her first baby, as well, so we’re sure that her expanding family will only add to the charm of the place! The B&B staff is super sweet and accommodating, and every morning, there’s a Mexican-style breakfast served at the always-impeccably-decorated communal table. There’s also a food map that the hotel designed to help you eat your way through the city, at places Maria and her staff specifically recommend. The communal space includes a television and comfy couch, a long dining room table, and an open kitchen that all feels really homey. Have you read the book Like Water for Chocolate? It explainss how much love Mexicans infuse into their cooking. El Diablo y La Sandia has a kitchen that reminded me of that book. It feels like a kitchen that was designed with a lot of love, that now serves as a space where people cook love into their food before serving it to you. The kitchen is also available for guest use, and there’s a detached honesty bar where you can serve yourself beer, soda, wine, and kombucha (YES!) that’s been brewed nearby. There’s a small store within the reception area that features locally-made items like artwork and mezcal, in case leaving the hotel to shop seems too overwhelming for you;). We know if you give this quirky, clean, cozy, and colorful place a chance, that you’ll fall in love with it just as much as we did! And when you do, please tell Maria and her family we send our love. Find room rates here, and know that you can book your reservation on that same website. Hotel Las Mariposas also identifies as a B&B, but it is one that has studio apartments available for longer stays and, and for people like us who like to self-cater during their vacations. The hotel owner’s name is Teresa, and she runs the B&B with her family. She lives on the premises and is always available to help guests. If she is not sitting in reception, you will find Cristel there to kindly accommodate your every need. 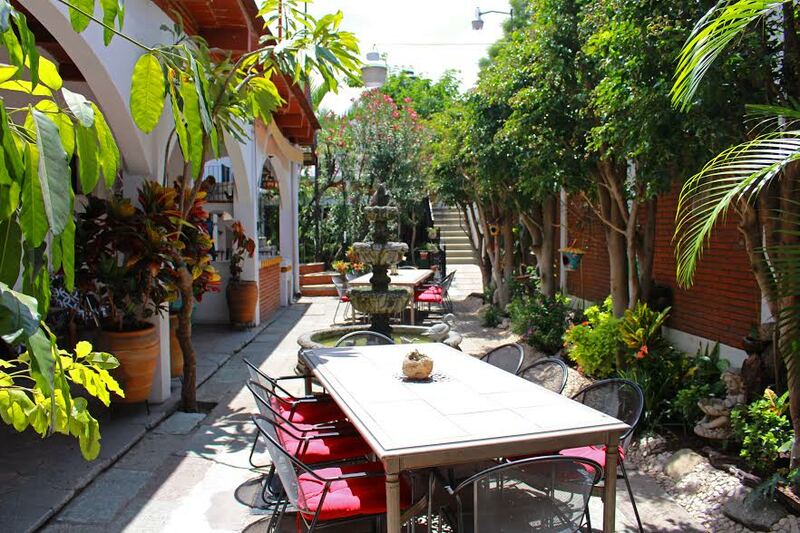 Las Mariposas is within very close walking distance of everything you’d want to see in historic Oaxaca, and there’s even a cute park within a block of the hotel with food and art vendors, and occasional carnivals. Because the hotel is family-owned and run, and Teresa cares about her guests having a memorable visit, the hotel decoratively honors and celebrates Mexican holidays and traditions. 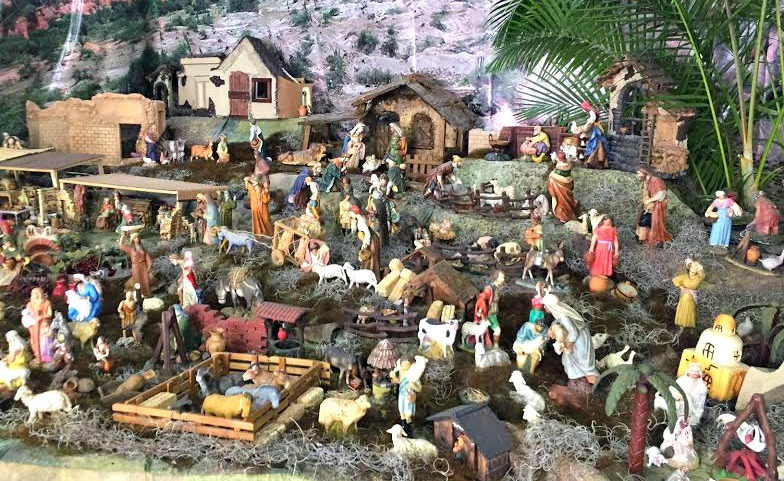 We spent Christmas day at the hotel, and were impressed to arrive to a giant nativity scene that took hotel staff hours to assemble. We love learning about local culture when we are traveling, so this was a really nice treat. It’s not easy being away from home for the holidays, which made it even more comforting to see festive little touches around the hotel, thanks to Teresa and her staff. Clean, comfortable, and spacious rooms surrounded by two lush and tranquil courtyards. You can choose from a regular B&B room (there are 13), five self-catering studio apartments, and two rooms with kitchenettes. There are well-equipped common areas adjacent to the courtyards, like a sitting-room with sofas, books and a TV, as well as a kitchen that can be utilized by guests. Seeing as how the family who runs the B&B lives on-site, there is always someone available to help you. Las Mariposas offers a massage service with a very nice and talented masseuse who comes directly to your room with her table, day or night. The price is amazing (400 pesos for 2 hours/20 USD for 2 hours). This was an indulgent and welcomed treat for us on Christmas Eve! Wherever possible, the hotel makes environmentally-friendly, and locally-sourced decisions. The water is heated by solar panels, the purified water available comes from a local spring, the coffee served at breakfast is fair-trade and locally-grown, laundry water is used to water the plants around the courtyards, and laundry products and trashbags on the premises are all biodegradable. To learn more about how the hotel is conscientiously-run, read these descriptions. We met many people during our stay at Hotel Las Mariposas that were return visitors, which says something about a hotel. 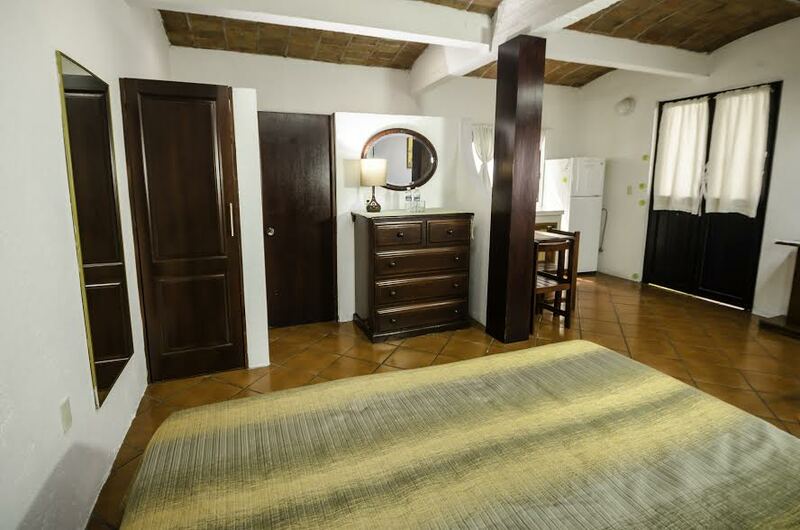 Book your room here, as we are sure the hotel would offer you a great and relaxing space from which to explore all of Oaxaca’s wonders. And please do let us know if there’s anything else we can do to help you plan your trip! Happy Travels! 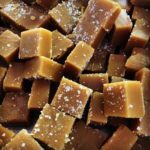 Mouth Party Caramels- O to the M to the G!